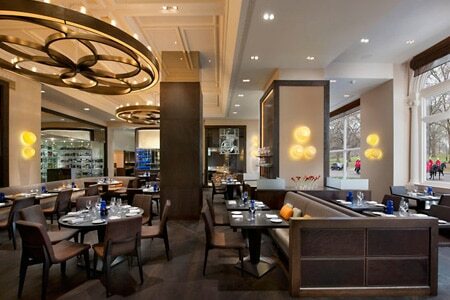 Heston Blumenthal delves into the past for contemporary British cuisine at the Mandarin Oriental Hyde Park. : While Heston Blumenthal’s The Fat Duck was at the cutting-edge of cooking, his restaurant at the Mandarin Oriental Hyde Park is another concept altogether. Along with head chef Ashley Palmer-Watts, Blumenthal has consulted historic British cuisine to come up with a decidedly different and intriguing experience. In an elegant interior of dark wood with a glassed-in kitchen and views over Hyde Park, you’re treated to the signature starter of “Meat Fruit” from 1500, resembling a Mandarin and opening to reveal chicken liver and foie gras parfait. Or try nettle porridge from 1660, a mix of frogs’ legs, girolles, garlic and fennel. Dip into the nineteenth century with roast turbot with mussel and seaweed ketchup, salmon roe and sea rosemary, or go native with spiced pigeon cooked in ale with artichokes. For pudding (not dessert), consider baked Sussex pond pudding from 1670, which is more subtle than it sounds: lemon caramel and Tahitian vanilla ice cream. The wine list is long and expensive; the service is very good and not overwhelming. As is the case at most top London restaurants, the set lunch (3-courses for £38) is a quite worthy introduction.